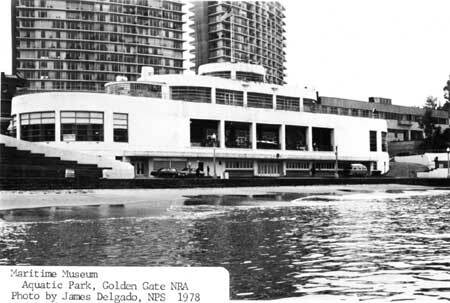 Maritime Museum, Aquatic Park, Golden Gate NRA, 1978. Builder/Architect: Works Progress Administration and William Mooser, Sr. and Jr.
San Francisco's Aquatic Park is a recreational complex on the waterfront of San Francisco Bay on the site of Black Point Cove, a natural landmark. Industrial activities in the 19th and early 20th centuries resulted in partial filling of the cove and creation of additional land on the site. Development of the Black Point Cove area as a recreational facility did not occur until the late 1920s, although it had been proposed as early as 1866. The main portion of the development proceeded with funding and manpower provided by the Works Progress Administration. A new beach, bathhouse, municipal pier, restrooms, concessions stand, stadia, and two speaker towers were constructed. All of these structures exist today with very few modifications since construction. The historic scene of Aquatic Park is basically unchanged from its appearance in 1939 when it was completed. The only two exceptions are the addition of a wooden pier with a small building completed in the 1940s, and a bocce ball court built in the 1950s. The enclosed site map shows the various structures and their relationship to each other. The Streamlined Moderne style, an off-shoot of the Art Deco and International styles, is evident not only in the design of the buildings and support facilities but also in the design of the graceful curve of the municipal pier and the beach. Streamlined Moderne tended to mimic the clean-lined design of ocean liners, so popular for travel at the time. The bathhouse, now the Maritime Museum Building is a four-story reinforced concrete structure designed by William Mooser, Senior and Junior, and constructed in 1939. The bathhouse is oval in plan and is the key structure of the development. The building's clean nautical lines and stepped levels evoke images of a ship. A Works Progress Administration (WPA) report stated: "Like a huge ship at its dock.. .with rounded ends, set back upper stories, porthole windows and ship rails, its resemblance to a luxurious ocean liner is indeed startling." The north side of the building facing the cove is flanked to the east and west by concrete stadia with seating for spectators. The stadia were originally intended to seat "many thousands who desire to watch athletic events, races and the large crowd at play..." in the lagoon, but they now are the setting for outdoor concerts and a resting place for tourists. Underneath the stadia are rooms used for storage and for the Aquatic Park lifeguard station. The easternmost stadium originally housed the hospital and first aid station for Aquatic Park beneath its benches. The building is banked into the slope of the land as it gradually descends toward San Francisco Bay. The main entrance to the building is on the second floor, at the south elevation facing the foot of Polk Street. Additional access is possible on the first floor through doors on the north elevation facing the beach. The building's historic white color has been retained. The flat roofs originally covered with red tile are now finished with a grey membrane roof. Original spotlights and air vents constructed in the shapes of ships' funnels remain, as does the original flagstaff on the roof (the bridge) of the fourth floor. The tubular steel railings edge the balconies of the upper stories These features add to the building's nautical character. Many of the windows in the building are round with metal frames, mimicking the portholes of a ship. Other windows are large, rectangular types with plate glass or wire glass and metal frames. Like the decks of a ship, the upper stories of this building have roof decks surrounded by metal railings. A small glass-block wing is on the eastern end of the third floor. The main entrance is sheltered by a small marquee. The original canvas awning extending out from the marquee and covering the sidewalk was removed after 1941. The doors are edged with a carved, green slate surround sculpted by WPA artist Sargent Johnson. Fountains flanking the main entrance are built of green slate and multi-colored tile; they no longer function. Exterior doors throughout the building are metal with glazed panels. The brass-plated handles are shaped like halves of ships' wheels. All of the exterior doors are original, except for the new, wider door installed on the southeast corner of the building to accommodate handicapped access. The original door is in storage. Two minor alterations to the building's exterior are the additions of signs identifying the building as the Maritime Museum: the most prominent sign is shaped like a ships' stern and is bolted to the wall above the entrance; the second sign consists of letters painted on the east side of the building. Both signs identify the structure as the Maritime Museum. The interior of the bathhouse features many original works of art done by various artists under the auspices of the WPA. The overall interior design of the building was supervised by artist Hilaire Hiler. The murals, sculptures, and other art works were completed by Hiler, Sargent Johnson, John Glut, Richard Ayer, and Beniamino Bufano. The main lounge of the bathhouse is on the second floor (street entrance). The terrazzo floor is composed of "varied colors executed in a variety of marbles which are all of American origin. Certain portions of it have been embellished by the addition of crushed abalone shells to the aggregate, particularly to the baseboard which leads to the wainscot...." The wainscot is Tennessee pink marble and Royal Jersey green marble. The wainscot is undamaged but the terrazzo floor is cracked. It is not known if the cracks impair the structural integrity of the floor. the general color scheme of the room, which is an off-complementary harmony of shades of red and green, is relieved in these panels, (the murals) by a more intricate and extended relation of another harmony based on blue-green and orange. The form-design of these paintings is a flowing arabesque based on the ocean wave form and variations of it. This is tied in with the architecture by a use of the right angle through the possibility of introducing architectural motifs into the paintings themselves by employing the legend of the lost Pacific continent.. .Mu. With this motif a very considerable and interesting, if somewhat involved symbolism is natural and possible. It is however, kept in a secondary role as the murals are neither primarily representational or symbolic, but decorative. Various representations of sea life, notably fish, squid, and shells abound in the murals. The mural on the west wall has the ribs, keel, and anchor of a sunken vessel intertwined with rope. Two figures representing Polynesian sea gods are on the north wall, near the stairwall. According to Hiler, the method used to paint the murals was a "wax-emulsion variation of the Gambier-Parry spirit fresco process...." Most of the murals are in good condition but slightly faded. The murals on the south walls inside the window recesses have been damaged by sunlight and water, and are separating from the walls. The chrome and glass light fixtures, designed by artist John Glut remain in the lounge. North of the main lounge is the portico, a recessed porch looking out over the bay. The portico edges are bordered with tubular steel railings. Stairways on the east and west ends of the portico lead to the grand concession on the first floor. The original design for the portico included tile mosaics on the three walls designed by Sargent Johnson. Only portions of the mosaics, featuring maritime motifs, were completed. The unfinished portions have been painted. Two pieces of sculpture--a red seal and a black frog carved by Beniamino Bufano--are in the portico. An elevator was installed in the portico around 1960. The men's restroom on the west side of the second floor has fixtures which appear to be original. East of the portico is the former restaurant, now the cafeteria and meeting room for the San Francisco Senior Center. The original blue paint finish on the walls was reminiscent of the ocean, with a lightly tinted blue near the ceiling getting progressively deeper as it reached the floor. The walls are now white. A frieze of removable wooden plaques representing Pacific coast yacht clubs has been removed and is in storage. The plaster and embedded-rope nautical designs on the walls remain. The original restaurant floor--a multi-colored terrazzo--remains. The kitchen has been updated to meet present needs. . . .a color circle covering the entire ceiling. A moving lighting fixture containing lights in the color of the Physical Primaries makes it possible to give striking demonstrations on the relationship of color and light. Charts showing the psychological Pigment Primaries, and the Solar Spectrum...adorn the walls and make the room a veritable full size color scheme...which its designer...calls a 'Prismatarium' functioning in relation to the field of color much as the Planetarium does for the heavens. . . . The light fixture no longer revolves, but the colors remain. The third floor of the building housed the banquet room, now used for exhibit display. The men's restroom at the east end of the building is now an office for the Maritime Museum Librarian, and the women's restroom is used for photographic storage. Two partitions were installed opposite the men's restroom in 1976 to create an exhibit bay for the Maritime Museum. The installation did extensive damage to abstract bas-reliefs by Richard Ayer, that featured more nautical motifs. The terrazzo floor in this room has a design following the lines of a shoal chart of the San Francisco Bay Region. Approximately 40% of the original floor was covered in 1976 when a carpet was glued to the floor. The original chrome and glass light fixtures remain. The third floor also contains a small pantry with glass-block walls, evident on the exterior east elevation. The room was partially panelled with black walnut by the San Francisco Maritime Museum in the 1950s, but the original walls and dumbwaiter are intact behind the panelling. The room is now the museum library. The fourth floor houses the radio room, which apparently never operated as such. The room is used as a museum office. A green ceramic lintel made by Sargent Johnson is above the door into the room. The light fixtures are original. Two doors from this room open out to a roof deck. The ground floor is at grade on the north (bay) elevation and below grade on the south (street) elevation. The main portion of the first floor is the former "Grand Concession" where a concessions stand operated and opened on to the beach at the north elevation. Artist Hilaire Hiler stated that the Grand Concession was "more utilitarian in function than the rest of the rooms...decorated by a studied coloring of each wall, embellished simply by international code flags and the emblems of the different steamships which pass the building. These enable spectators to identify ships while adding color and interest to the walls." Unfortunately, the walls have been repainted so that the flags and emblems are no longer visible. West of the Grand Concessions are the women's dressing room and showers, still in use today. The men's and boys' dressing rooms and showers are to the east. Between them is a former ticket booth and repository for clothing and valuables. The ticket booth area, as well as the boys' showers and locker room, are now used as storage and office space for the Maritime Museum. The building is in good structural condition, although some of the concrete walls have been damaged by moisture. The concessions stand and men's restroom is at the approach to the Municipal Pier. This WPA structure was designed as part of the Aquatic Park complex, and its architecture reflects the same rounded, nautical Streamlined-Moderne elements as the other buildings of the group. The building is simpler in design and decoration, with two bands of a wave design embellishing the upper part of the concrete walls. The fixed metal sash windows in the restroom are shaped like portholes. The building contains a partial basement for storage. Changes to the building include a new concrete floor, the addition of new kitchen equipment and a stainless steel counter, and the addition of an awning over the counter and serving windows. The restroom is in original condition. A stairway, now closed to the public wraps around the exterior of the building to the roof and observation deck. The deck has built-in benches and a small shelter. The edges of the deck are bordered by the roof parapet and the original metal rail, like that on the Maritime Museum. At the far eastern end of Aquatic Park adjacent to the Rowing Club buildings is a small restroom built as part of the WPA Aquatic Park complex. The oval-shaped building has a stucco exterior. The building's design elements are the same as those of the other buildings of the complex: the oval lines of the building, and the staircase that wraps around the exterior. The roof of the building was designed for use as a lifeguard station. The building seems to be in original condition, although the interior plumbing fixtures and partitions have been vandalized. Two reinforced concrete speaker towers are east and west of the stadia of the bathhouse. Both towers are 35 feet high. The simple concrete pier of each tower artfully flanges out toward the speaker housing at the top. The housing is circular in plan, and has a series of concentric horizontal bands shielding the opening for the speaker. A metal ladder bolted to the concrete base provides access to the speaker housing. The towers are of the same Streamlined-Moderne design of the other WPA structures. The Sea Scout building near the entrance to the Municipal Pier is a one-story building of wood-frame construction. The building was constructed on pilings over the waters of the lagoon and is connected by a wooden walkway to the adjacent land. The building has a boat docking facility. The interior contains many small rooms used for storage, offices, classrooms, and boat repair facilities for the Sea Scout organization. The Aquatic Park lagoon occupies the site of the former Black Point Cove, which was partially filled in during the early 20th century. The lagoon was supplied with a new sand beach, since the former beach had been buried under tons of rubble and fill. Most of the sand for the new beach came from excavations in downtown San Francisco for the Union Square underground parking garage built in 1941. The grading and reshaping of the lagoon and the addition of the new sand beach do not seem to have been altered or modified since the 1940s and are in good condition. The seawall at Aquatic Park was built between 1934 and 1938 out of granite paving blocks from San Francisco streets. The blocks were taken up from the streets during a city-sponsored modernization and were reused in the seawall. The seawall is crescent-shaped in plan, following the contour of the water's edge. The wall is seven tiers high at the beach, and increases to ten tiers as it stretches toward and then under the Municipal Pier. The seawall has not been modified and is in good condition. The Municipal Pier is reinforced concrete, built on pilings over the seawall that shelters the Aquatic Park lagoon. Built in 1929, with subsequent repairs in 1947 and 1955, the pier has a curvilinear plan with a round, bulb-like end. The pilings are concrete and support a wood, concrete, and asphalt deck. Benches and streetlights are located periodically along the pier. A small, reinforced-concrete building is at the end of the pier. The building was constructed as a comfort station, but the interior was never developed. The bocce ball courts erected in the 1950s are the most recent structural additions to Aquatic Park. The concrete lanes are shaded by a small protective shelter. The area is fenced with a metal chain-link fence. San Francisco's Aquatic Park is of national significance in architecture and landscape architecture because of its outstandingly thorough and masterful design. The style in which the buildings of the complex are constructed--Streamlined Moderne--lends itself perfectly to the curvilinear shape of the Municipal Pier that swings a protective arm out into the bay. The roundness of the building walls, the repetition of the nautical elements such as porthole windows, and art works with aquatic motifs all combine into a common sense of design and purpose. The buildings and the site design are outstanding examples of Streamlined Moderne. The park has no architectural parallel on the west coast, and although on a smaller scale, it rivals the design quality of portions of Miami Beach, famous for its Deco and Moderne buildings. The structures remain largely unaltered, and thus have extremely high architectural integrity. The art works inside the bathhouse (Maritime Museum) are outstanding examples of federally-funded art of the 1930s. The murals on the street-level floor and the work done in the Prismatorium (Ladies' lounge) were executed by internationally known artist Hilaire Hiler. The murals are Hiler's best-known works of art and are pioneering examples of his work in color theory. The art work on the marquee, the tile work on the portico, and the relief over the main door on the fourth floor are outstanding examples of work by California black artist Sargent Johnson. The sculptures on the portico by Beniamino Bufano are outstanding examples of that San Francisco sculptor's work. Additional work by Richard Ayer and Charles Nunemaker are of the same high quality as the other Federal Arts Project contributions in the building. The small murals beneath one of the stadia, executed by an unknown military artist, are of regional significance as a vernacular art form associated with the significant military use of the structure during World War II. Aquatic Park is of regional significance in the area of military history as the headquarters for the Anti-Aircraft Defense of the Pacific coast states during the Second World War. The Sea Scout building was constructed during the military occupation of Aquatic Park. Aquatic Park is of regional significance in the area of social/humanitarian movements, as one of California' s most extensive and noteworthy results of the work relief programs of the 1930s. The large-scale development of Aquatic Park under the WPA and Federal Arts Project resulted in a grandiose and impressive development--one of the most costly WPA projects in California--that gained national recognition for its ambitious plan. A portion of the site is also nationally significant as the first formal senior citizen's center in the United States. Aquatic Park is also of local significance as the site of the San Francisco (now the National) Maritime Museum, an innovative and pioneering museum responsible for the preservation and public display of intact floating vessels in Aquatic park lagoon, and for unique exhibits of actual vessel parts and machinery. San Francisco's Aquatic park is of local significance in the area of recreation. The park has been a favorite spot for recreation in San Francisco since the Civil War. Extensive construction and development in the 1930s under the Works Progress Administration transformed the former industrial site and half-filled cove into a modern park with aquatically-oriented recreational facilities. The park is used today by swimmers, fishermen, local people, and tourists who like to experience that small, intimate part of San Francisco Bay. Aquatic Park is also of local significance in the area of community planning. The concept of an aquatic park at this locale was first advocated in 1866 by landscape architect Frederick Law Olmsted. In his Preliminary Report in Regard to a Plan of Public Pleasure Grounds for the City of San Francisco Olmsted proposed a marine plaza, landing quay, and public park. The plan was not adopted. In 1905 architect and urban planner Daniel Burnham, by invitation of local citizens interested in the "City Beautiful" movement proposed a major redevelopment of San Francisco. The Burnham Plan suggested that the site be developed as a "bay shore park" with rowing and swimming clubhouses and a yacht harbor. Burnham's plan was also rejected, but in 1909 community efforts began to set aside the land for a public park devoted to aquatic sports. Initial successes in 1916 spurred further action and site development began in earnest in 1927. Delgado, James P. Historic Structures Report, Historical Data Section: Pioneer, Politics, and Planning: The Story of San Francisco's Aquatic Park. San Francisco: National Park Service, 1981. Toogood, Anna Coxe. Historic Resource Study: The Bay Area Community, A Civilian History of the Golden Gate National Recreation Area and Point Reyes National Seashore. Denver: National Park Service, Denver Service Center, 1980. Commencing at a point some twenty feet northeast of the end of the Municipal Pier and running west to the end of said pier, running along the northwest outside edge of said pier, passing points B and C; to the end of said pier at the terminus of Van Ness Avenue which is point D; running south along the east edge of Van Ness Avenue to a point some 50 feet west of the terminus of Beach Street, which is point E; running along the north end of Beach street until reaching the northwest corner of the intersection of Beach and Hyde Street, which is point F; running north along the west edge of Hyde Street to the southwest corner of the intersection of Hyde and Jefferson streets, which is point G; and running west along the south edge of Jefferson Street for a distance of approximately 30 feet which is point H, and then running north, passing between the Aquatic Park restroom on the west and the San Francisco Rowing Club building on the east and running then northwesterly, passing Point I until reaching the point of beginning, which is point A.